Stacy Lewis made a big promise, and she delivered in a major way. Lewis closed with a three-under 69 to win the Cambia Portland Classic on Sunday, meaning her entire first-place check of $195,000 will be donated to Houston relief efforts as the area recovers from Hurricane Harvey damage. The 32-year-old Lewis grew up in The Woodlands, just outside of Houston, and still lives in the area with her husband, Gerrod Chadwell, who is the University of Houston women's golf coach. On Wednesday Lewis tweeted that she would donate her entire check from this week's event toward Houston's recovery—and then she went out and ended a long slump, winning for the first time since June 2014. It's her 12th LPGA victory overall. "You know, when I said that I had the goal of winning the tournament—you got to get a lot of things right, to go your way," Lewis said standing off the 18th green. "Just what we're going to be able to do, we're going to be able to help rebuild houses and get their homes back. That's more important than anything." 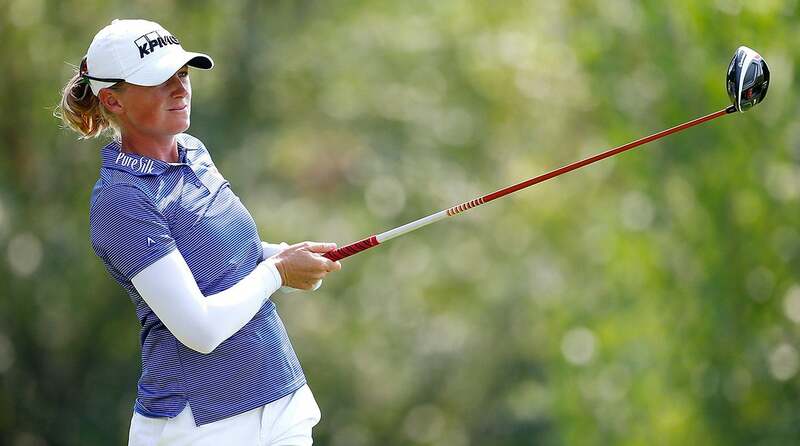 It had been 83 starts since her last win, which came at the Walmart NW Arkansas Championship. She had been the runner-up a dozen times since then. Lewis entered Sunday with a three-stroke lead over Moriya Juntanugarn and hung on late to beat In Gee Chun by one. Lewis finished 20 under overall. "It would be probably one of my most special wins, just to be able to do this for the people in Texas and to do it too when everybody is watching," she said. "I kind of put all the eyeballs on me and put some pressure on myself, so it's nice to kind of see myself performing, too." But the pressure wasn't too much for Lewis. She birdied the first two holes on Sunday and made the turn in three under for the day and with a four-shot lead. Chun birdied the 12th to cut the lead to two and then birdied the 16th to make it a one-stroke lead with two to play. After missing the green on her approach at 17, Lewis made a clutch up-and-down punctuated by a key par putt to keep the lead at one. On 18, after Chun missed the green, Lewis blasted out of a fairway bunker, found the green and two-putted for the win. She parred every hole on the back nine. While the timing of Lewis's most recent victory couldn't have been better, it's been a long wait for the former No. 1 player in the world. In the past few years she's dropped down to 18th in the world. "I'm excited to get the monkey off my back and just to know I can do it," Lewis said. "I can hit the shots when I need to and hit the putts when I need to. It's nice to see yourself do that again." Besides promising her paycheck to Houston, she also urged fellow players to provide her shoes that she can bring back to Texas to donate. Cambia and the LPGA are donating portions of the week's proceeds to Houston, and several other pros have promised the same over the past week. KPMG, one of Lewis's main sponsors, also said it would match Lewis's $195,000 donation.